Encouraging your family to exercise is important for keeping them fit and healthy and protecting against serious health problems such as cardiovascular disease and type 2 diabetes or mental conditions like depression. Inactive children are likely to be even more inactive during adulthood, but you can help prevent this by making family activities and fitness a part of your child’s life at an early age. By making time to exercise together as a family, you can spend fun, quality time with your kids whilst helping them form healthy habits for life. When leaving home to go to a friend’s house, your child’s school or simply for some fresh air, try and leave the car at home and walk or cycle there. Make a note of the distance you and your family cover and try to stick to this every week. To track your progress, use a family exercise log or chart and place it somewhere in your home where it will remind you to keep up the good effort together (e.g. on the refrigerator). 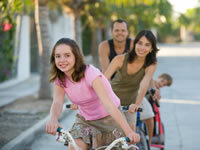 Set aside one day of the week or, if possible, a weekend to do something active as a family. This could include biking or hiking breaks, trips to the seaside for some swimming, or taking your little one to the park/playground. Wherever you go, don’t forget to pack some healthy, energy-boosting snacks as these will come in handy after a good workout. Find out about fitness classes that are offered to parents and kids together, such as swimming, aerobics or yoga. These exercises help strengthen the body and mind, and doing them as a family provides another way for you to all spend quality time together. Set aside at least 30 minutes three times a week to do fun exercises or activities with your kids after they finish school. You could take them for a kick-about in the park, play a game of hide-and-seek or go for an evening jog or walk. Whatever you do, make sure your kids don’t spend the evenings glued to the television. There are various things you can do make chores around the house less boring and more fun. Instead of setting separate tasks for each member of the family, carry out chores in pairs (or if there are three of you, give your partner a rest and work together with your child). Make a note of the time it takes you to complete the work and aim to beat this the following week. If you’re cleaning the house, play music and encourage the kids to sing and dance while helping. If you have a dog, take it for walks together or get your children to cycle or roller-skate along.